Para keng aliwang gamit, lawen ye ing Blueberry (disambiguation). BNZ, n.d: "Blueberries New Zealand Inc" Web page at the site of the organization of the same name, accessed August 24, 2006. Clayton-Greene, K.: Web page titled "THE BLUEBERRY INDUSTRY IN AUSTRALIA: AN OVERVIEW" a summary of an article at the Web site for the International Society for Horticultural Science. The article appears to have been written in the 1990s, accessed August 24, 2006. Gaskell, Mark. "Strategies for Off-Season Blueberry Production on Coastal California Small Farms," an article in "Central Coast Agriculture Highlights" a newsletter published by the University of California Cooperative Extension, February 2006 issue, page 2, accessed August 24, 2006. Nauman, W.D. Web page titled "OVERVIEW OF THE VACCINIUM INDUSTRY IN WESTERN EUROPE," a summary of an article by W.D. Naumann presented at the Fifth International Symposium on Vaccinium Culture and published in July 1993, from the Web site of the International Society for Horticultural Science, accessed August 24, 2006. Sweeney M.I., Kalt W., MacKinnon S.L., Ashby J. and Gottschall-Pass K.T. Feeding of diets enriched in lowbush blueberries (Vaccinium angustifolium) for six weeks decreases stroke severity in rats. Nutritional Neuroscience 5: 427-431, 2002. Matchett, M.D., MacKinnon, S.L., Sweeney, M.I., Gottschall-Pass, K.T., and Hurta, R.A.R. 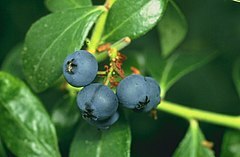 Blueberry flavonoids inhibit matrix metalloproteinase activity in DU145 human prostate cancer cells. Biochem Cell Biol. 83: 637-643, 2005. University of California Cooperative Extension (2006). Strategies for Off-Season Blueberry Production on Coastal California Small Farms (pdf file) an article by Mark Gaskell in Central Coast Agriculture Highlights newsletter. Accessed August 24 2006.